In 2016-2017, we are blessed with a plethora of NLP-related offerings! If you are interested in extracting information and meaning from text through machine learning techniques, then consider taking CS6740/IS6300, Advanced Language Technologies (offered Spring 2017; to get a feel for that the course will be like, see the Spring 2016 offering). If you are interested in studying formal representation of language meaning, and designing algorithms to learn to map sentences to such representations, then consider taking CS6741, Structured Prediction for Natural Language Processing (offered Fall 2016; to get a feel for what the course will be like, see the Fall 2015 offering). 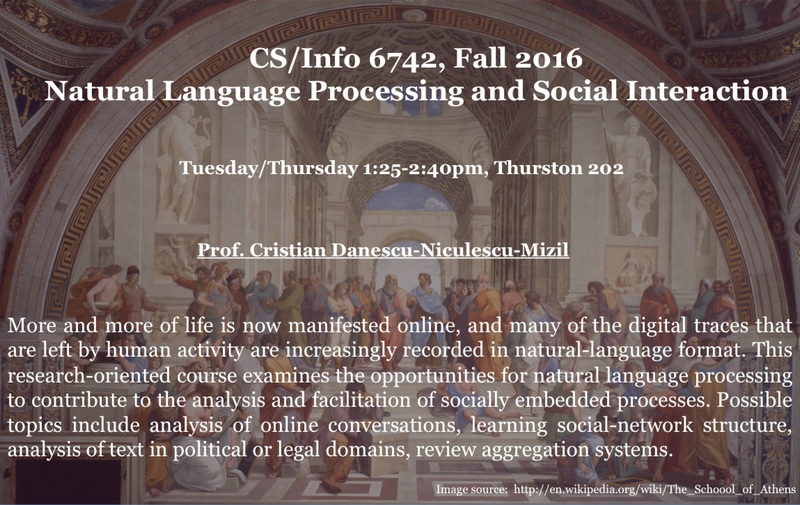 If you are interested in exploring the social aspects of language and its role in online interactions, then consider taking CS6742, Natural Language Processing and Social Interaction (offered Fall 2016; to get a feel for what the course will be like, see the Fall 2015 offering). Course homepage http://www.cs.cornell.edu/courses/cs6742/2016fa. Main site for course info, assignments, readings, lecture references, etc. ; updated frequently. Piazza page http://piazza.com/cornell/Fall2016/cs6742 Course announcements and Q&A/discussion site. Social interaction and all that, you know. Pilot empirical study for a research idea based on readings provided. Details will be appear here before each lecture. #2 Aug 25: Reviewing: a social experience? Wu, Fang and Bernardo A. Huberman.2010. Opinion formation under costly expression. ACM Transactions on Intelligent Systems and Technology 1 (1): 1-13. Danescu-Niculescu-Mizil, Cristian, Moritz Sudhof, Dan Jurafsky, Jure Leskovec, Christopher Potts. 2013. A computational approach to politeness with application to social factors. ACL. David, Shay and Trevor J Pinch.2006. Six degrees of reputation: The use and abuse of online review and recommendation systems. First Monday, no. Special Issue on Commercial Applications of the Internet. Reddit. Online thread visualizer by Kawandeep Virdee and different types of threads. #8 Sep 15: (Breaking) conversation "rules"
Langer, Ellen J, Arthur Blank, and Benzion Chanowitz.1978. The mindlessness of ostensibly thoughtful action: The role of "placebic" information in interpersonal interaction. J Pers Soc Psychol 36 (6): 635. Justine Zhang, Ravi Kumar, Sujith Ravi, and Cristian Danescu-Niculescu-Mizil. 2016. 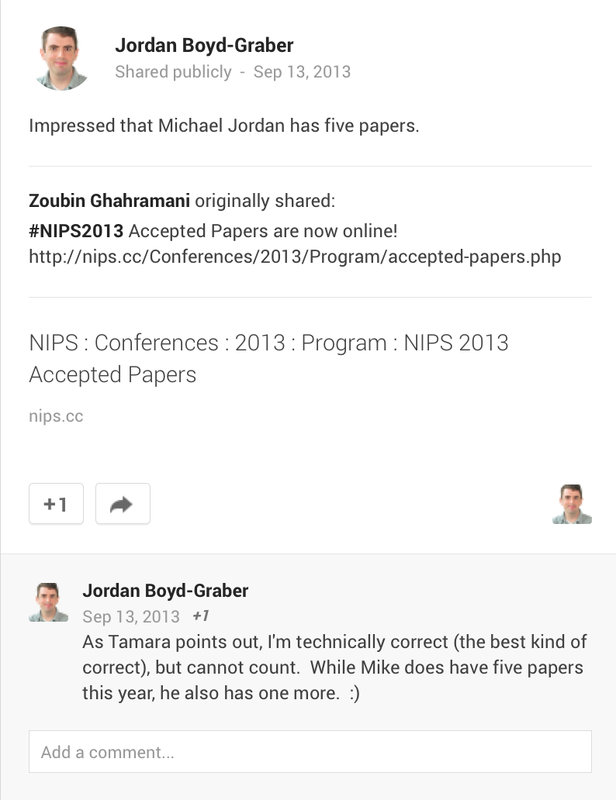 Conversational flow in oxford-style debates. In Proceedings of NAACL. Guerini, Marco, Gözde Ozbal, and Carlo Strapparava. 2015. Echoes of persuasion: The effect of euphony in persuasive communication. NAACL, pp. 1483-1493. Danescu-Niculescu-Mizil, Cristian, Justin Cheng, Jon Kleinberg, and Lillian Lee. 2012. You had me at hello: How phrasing affects memorability. ACL, pp. 892-901. Next week we'll have mandatory project progress-and-problems appointments. By 2pm the afternoon before your progress-and-problems appointment day, post a Piazza followup to your proposal that summarizes your progress and what discussion points or problems you'd like to bring up with me. Ideally, this followup post will be the agenda for your team's appointment, and will make the meeting efficient and useful for you. #24-25 Nov 22: Entropy case study: language change. Review of practical research tips. Controlls in observational studies. We make this requirement to facilitate submission to ICWSM 2017. However, note that your final-project submission should have your names and acknowledgments included, in a particular format (see item 1c amd 2b below); in contrast, you will want to strip any identifying information for ICWSM submissions. An "acknowledgments" section: give the name and state the contribution of those who you received significant help from. (This may or may not include your advisor(s), your instructor, fellow students in the class).